I like Liz with Greg from CSI. Okay. Which Crossover Liz pairing do I like? Next would have to be Liz/Dean. 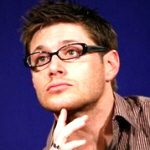 C'mon...Shiri and Jensen is just too good a combination to pass up! Liz/Sark...what would they be? Sizzler or Sparkler? I think LittleBit once called them Sparkers? Anywho, David Anders is mouthwatering. Hehe. Um....Liz/Spike. I mean for real girls....James Marsters, fake Cockney accent, the leather duster and those jeans and button up shirts? Whew! I'd like to see a Liz/Angel a/o Angelus pairing...has anyone written one of those? I'd like to see one. I'd like to see a Liz/ Gibbs (y'know Jethro Gibbs from NCIS...I know he could be her father but hey, a lot of couples have huge age gaps!) that would be interesting to see. Hey, I have a question that might stir up things on this thread. Who do you NOT see Liz with? I just can't see them with Liz. Mainly because I love the pairings that they are already in and can't stand the thought of breaking them up (Mainly Pacey, Michael, Angel and Logan) but what do you guys think? Hmm, here are a few of the ones I can think of off the top of my head. Now will I read fics with these guys as Liz's leading man, yes, except Dawson I dislike his character with a passion. But at the very least I'd never write Liz with these guys. I tried once w/ Angelus and I was cringing the whole story. I love Lucas with Sophia and Angel w/ Buffy I can't see them w/ anyone else. I love Lucas with Sophia and Angel w/ Buffy I can't see them w/ anyone else. I too hate Dawson with a passion! Actually, I once considered writing a crossover between the two shows and it would not have showed Max or Dawson in a good light. I think Dawson/Pacey's and Max/Michael's relationships are very similiar. I'm sorry, but Legolas? I think I pulled something laughing. Anyway, of the choices in the poll, Zack has the most in common with Max. I'm not a fan of crossover pairings as a rule, I think they have plausibility issues, but I saw a great graphic pairing Liz with Daniel Jackson and now I can't seem to find it any more. Anyone care to fess up? jesse/liz (mutant x) theres not one anyones thought of! i would love to read some like HP and MX cuz there aint every many infact, for MX i dont think there are any!!! please can someone tell me if there are and if so where they r? i really wanna read gunn/liz aswell!! !